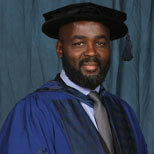 Patrick Clarke OBE is an alumnus of LSBU's MBA programme. In his professional life, he is responsible for supplying the power on which we all depend. Outside the office, he works tirelessly to encourage people from all backgrounds to raise their aspirations and achieve their potential. Patrick Clarke was born in Jamaica and came to England at the age of 8. He found it difficult to adjust to life in a new country, and struggled badly at school. 'I was put in a class for people with learning difficulties,' he says. 'And that's how I thought of myself.' It wasn't until he was about to leave school that a chance comment from his English teacher, Mr Turner, made him realise there could be more to life than just scraping by. Mr Turner offered to give him lessons after school, and with his support – and plenty of hard work – Patrick succeeded in passing 3 O-levels. From school, he set out to get a trade, joining the London Electricity Board as an apprentice technical engineer. It marked the start of what was to prove a meteoric rise. During his time with the LEB, Patrick rose from engineer to become general manager of various subsidiary companies, each employing around 500 employees and with an annual turnover of £50 million. It was at this point that Patrick began to think seriously about his future. He had realised that his interests – and his strengths – lay in managing people, rather than in his technical skills. He enrolled on South Bank's MBA course, writing his dissertation on how to motivate and inspire people. The former struggling student graduated with Distinction. Armed with his new-found knowledge, Patrick joined EDF Energy in 2000, as Head of Network Operations. Stints in HR, Communications and Connections followed, each step bringing with it greater responsibility and the opportunity to apply his skills across an ever broader area. Since 2011, he has been Executive Director of Network Operations, responsible for ensuring the smooth supply of energy to a third of the UK's population – some 20 million people. The role has included delivering infrastructure projects for the 2012 Olympics, and managing the energy supply for historic events including the Royal Wedding and the Queen's Golden Jubilee. Outside work Patrick has, if anything, been even busier. He has been closely involved in supporting the community in his local area of south London and beyond since the 1980s. He has been a special constable, chaired minority ethnic mentoring project MERLIN, sat on the board of Race for Opportunity and been a member of Business in the Community's London Leadership Team. In 2005, he co-authored a book, Made in Britain, about inspirational role models. Since 2011, he has sat on the board of the charity Urban Synergy, which gives young people from diverse backgrounds the chance to spend time with positive role models from a wide range of professions. Patrick has been nominated London Volunteer of the Year by Business in the Community and voted among the top 50 most influential Afro-Caribbean men in the UK five times in recent years. He became an OBE in 2012.